Meet your new favorite desk. This stunning rosewood executive desk is attributed to designer Fabio Lenci for Bernini and strikes the perfect balance between form and function. Absolutely breathtaking rosewood grains are featured on all sides of this masterpiece. I mean, just look at the beatuiful patterns on the desktop and drawer faces. On the left, you have two regular sized drawers and an upper, pencil-drawer with built in storage organizer. On the right, you have one large and extremely long file cabinet. If you wanted more traditional storage, you could easily slide in some thin plywood sides on the left and right to contain your clutter. The pencil drawer and large file drawer both lock and we are lucky enough to have the original key. Chrome pulls and gorgeous chrome legs give this piece the perfect amount of "pop". Very good vintage conditio, wear commensurate with age and use. 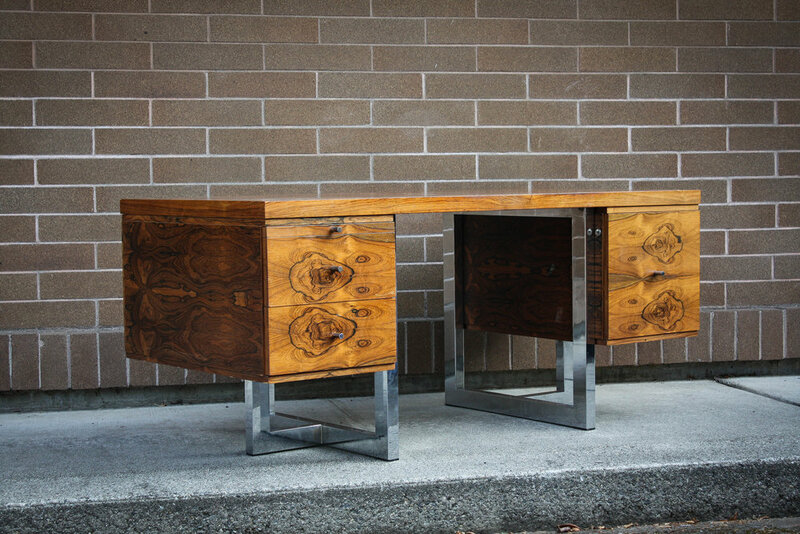 The best part about this desk is it is so jaw-droppingly gorgeous, and the grain pattern is so exotic, and imperfections are not readily noticeable, and unless your guests inspect every square inch of your furniture pieces, they would never know it was used.